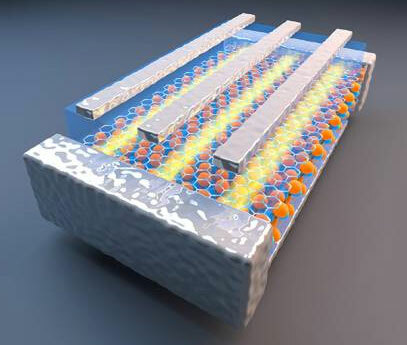 (Nanowerk News) Researchers at MIT say they have carried out a theoretical analysis showing that a family of two-dimensional materials exhibits exotic quantum properties that may enable a new type of nanoscale electronics. These materials are predicted to show a phenomenon called the quantum spin Hall (QSH) effect, and belong to a class of materials known as transition metal dichalcogenides, with layers a few atoms thick. The findings are detailed in a paper appearing this week in the journal Science ("Quantum spin Hall effect in two-dimensional transition metal dichalcogenides"), co-authored by MIT postdocs Xiaofeng Qian and Junwei Liu; assistant professor of physics Liang Fu; and Ju Li, a professor of nuclear science and engineering and materials science and engineering.